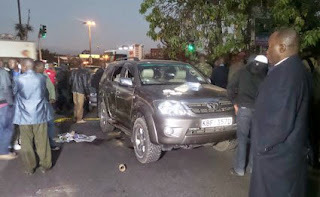 Gunmen sprayed Kabete MP George Muchai's car with bullets February 7, 2014 morning at the Kenyatta Avenue roundabout in Nairobi. The MP, his two bodyguards and a driver died in the incident. Kabete MP George Muchai was shot dead early Saturday morning at Kenyatta Avenue-Uhuru Highway roundabout in Nairobi. in the incident, Nairobi Central Police OCPD Paul Wanjama confirmed. The incident, according to Mr Wanjama, happened between 3am and 4.30 am. The four were in the same car as another one with family members, including the wife and a daughter of the MP, followed from behind. Occupants of the second vehicle said the MP stopped at the roundabout when four people with big guns approached his car and started shooting. "They just started spraying it with bullets. When we saw that, our driver sped past the other car and when we came back to the scene a few minutes later, all the occupants of the vehicle were dead," the relative told detectives at the scene. A newspaper vendor who witnessed the shooting told the police that one of the gunmen who led the shooting had a facemask. The bodies of the four had bullet wounds in the head and chest. They were taken to the Lee Funeral home at 6.30am. Legislators who arrived at the Lee Funeral Home asked the government to do a thorough investigation into the killing, saying it would be easy to get the murderers as the scene of the crime is under the surveillance of CCTV cameras. Kiambu Senator Kimani Wamatangi said Mr Muchai had been threatened several times and had reported the threats to the police. "The CCTV clips should be handed to the detectives as soon as possible. There is no way the perpetrators will not be known" he said. Nairobi Senator Mike Sonko, who also arrived at the crime scene, asked the government to take the safety of legislators in the country seriously. Other legislators at the Lee Funeral Home include Gatundu North MP Kigwa Njenga, Kipipiri MP Samuel Gichingi, Ruiru MP Esther Gathogo, Juve Njomo, MP for Kiambu and Kiambu Women Representative Anne Gathechu. They all alleged that Mr Muchai's death was a clear assassination whose execution was planned.